BENFICA TICKETS Sport Lisboa e Benfica, commonly known as Benfica or SLB, is a Portuguese sports club based in Lisbon, Portugal. 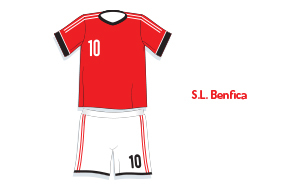 Benfica is one of the most important football clubs in Portugal. Benfica stadium is the Estadio da Luz which has a capacity of 65,647. It is also called A Catedral ("The Cathedral") by Benfica supporters. It is a UEFA category 4 stadium and the twenty-first biggest stadium by capacity in Europe. The Estadio da Luz hosted several matches in the UEFA Euro 2004 including the the 2014 UEFA Champions League Final. Book your Benfica 2018-2019 tickets securely online. Benfica Champions League tickets for home & away matches.